Les pochettes There are 4 products. 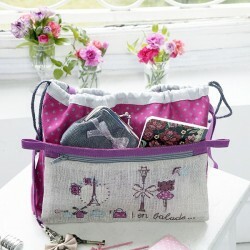 An indispensable handbag organiser ! You can store all your loose items in its' 8 pockets, ready to transfer from one handbag to another. The Brodeuses Parisiennes touch, the clasp and braid attached to the bag so you never lose your keys again! An indispensable handbag organiser ! You can store all your loose items in its' 8 pockets, ready to transfer from one handbag to another. The Brodeuses Parisiennes touch, the clasp and floral braid attached to the bag so you never lose your keys again! A perfect travel clutch to carry all your travel documents! You won’t forget anything and have everything at hand, electronic airline tickets or train tickets, travel documents and identity papers, it is simply perfect to carry them all.